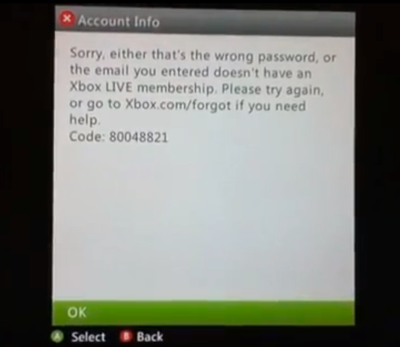 Last night, when logging into Xbox Live, it wouldn’t let me log in and ultimately gave me “code 80048821”. This code is not listed in the list of codes on xbox.com, and most of the results of a Google search returned info on Windows Live Messenger, not the Xbox. After resetting my password and trying again, it still didn’t work. I finally gave up and called Xbox Live support, where I talked with a very helpful tech. He suggested re-downloading my profile, but that didn’t fix it. We made sure that my Xbox Live Gold membership was renewed and in good standing (it was). 1) Go to Settings, and then System. 4) Select Clear Cache, and press Yes. After rebooting the Xbox, everything worked fine. I’m not sure if clearing the system cache was sufficient to get it working, or if I also needed to re-download my profile, but these steps fixed the problem. This entry was posted in Gaming, Tech. Bookmark the permalink. I just found this searching for a solution to the same problem. I cleared the cache without re-downloading the profile and the problem was fixed. Thank you! I had to clear the cache, reboot, and download the profile to make it work. Thanks for the instructions. I did the steps without re-downloading the profile and it didn’t work and same error code.. So I’m going to guess Xbox just hates me. I take my comment back, I got the error again but when I went to retry the steps it cleared I guess why I cleared the cache..
while** It worked on its own without notifying me is what I mean after I got the error message the 2nd time. I had a similar issue; When I turn on my xbox I am signed on to my profile but not XBL. I select connect to XBL and get the described error. I go through the windows and get the error code described above however I see that my account has signed in to XBL because I see that friends are online. If I press either B or A (either button takes you back to enter your email address) and then press the home button I see my Home screen with my account (signed in to XBL). The only problem is when I started a game that allows XBL gameplay I would have to sign in again and get the same error (huge pain in the rear). After clearing the cache on my xbox this second login issue was resolved, but I still have the initial issue every time I turn on my xbox or sign out then sign in to my profile. I did not re-download my profile but I think I will because I can see this getting very annoying! Clearing the cache worked for me. Thanks! This worked PERFECTLY, I thank you as much as the internet allows, and I thank that very helpful techie! had this happen a month ago, it went away, now its back, and nothing gets rid of it, wtf? THANKS, BRO! Dowloaded the profile and then cleared the cache and it worked fine! Same problem. Cleared cache, didn’t download the profile, reboot the XBox and it’s working again. Thanks!